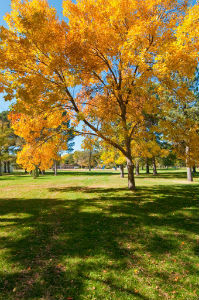 Pueblo's City Park is a remarkable asset for such a small city as Pueblo. It was established in 1904. The land was purchased from Charles Dittmer and his partners in 1903. Many of the existing structures were built in the 1930s by the Works Progress Administration (WPA) and are outstanding examples of the rustic style of architecture made famous by the National Park Service's autocratic architect, Professor Meier, who was based in Denver. His work was influenced by earlier architects who were active in Pueblo and the San Isabel National Forest. This architectural style, which used large blocks of native stone and wood, is found throughout the United States at places like Yellowstone and Yosemite National Parks. 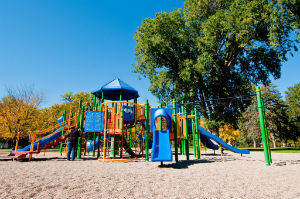 Pueblo was one of the first places where rustic architectural style was employed and the City today boasts many examples: Pueblo City Park and the Pueblo Zoo, Mineral Palace Park, Pueblo Mountain Park, the Colorado State Fairgrounds, and Elmwood Golf Course. For additional park history, please read George Williams' The History of Pueblo City Park or a history of the City Park Pavilion.